UW School of Nursing graduates go on to pursue many diverse career opportunities. 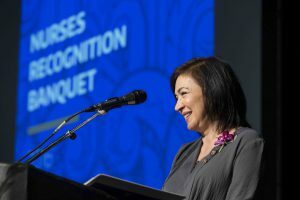 But only Marjorie DesRosier, PhD, RN has gone on to become a distinguished historian of nursing and an international detective. After completing her MN and PhD work at the SON, Marty served as a clinical assistant professor here for eight years, imparting to her students’ knowledge about research methodology and philosophy of science and providing them a solid foundation for their future endeavors, whether research or clinical. But history was calling, and since 2003 Marty has been an independent nurse historian and scholar specializing in nursing history from the late-19th through the 20th century. Her meticulous archival research led to extraordinary documentation of the early years of the Red Cross, and then to an international historical study of Hôpital Temporaire d’Arc-en-Barrois. Created in the shell of a chateau, this temporary military hospital was staffed by an international corps of nurses and physicians. It served more than 3000 French soldiers wounded in World War 1. The research was an international collaboration that told the story of not just one military hospital, but of the social and medical impact of the war on those both directly and indirectly involved. This compelling story was published on the centennial of the war as the book, L’hôpital Militaire Anglais d’Arc-en-Barrois (1915-1919). Marty became an international detective when she joined a worldwide search for surviving relatives of a young Irish nurse, Josephine Heffernan, who in 1918 lost an ID bracelet with her name on it while serving in the military. Discovery of the bracelet led to a 15-year search that cover multiple continents and involved parallel research by Marty in the U.S. and three colleagues in France. Combing archival sources, they determined that Heffernan emigrated to the U.S. in 1906, joined the U.S. Army Nurse Corps in 1910, and was sent to a U.S. military hospital in Rimaucourt, France toward the end of WW I. It was there that the bracelet was lost, and found decades later by an eight-year-old school boy who brought it to his teacher. It wasn’t until the teacher, Estelle Lefeuvre, retired that she began the search for information about the bracelet’s owner. She was soon joined by Marty, French researchers, and a documentary film maker. The multinational travels of Heffernan considerably complicated the search; the assumption at first was that she was an American. But the discovery of a death record finally led to finding that the nurse’s endeavors had taken her to many places around the world, and ultimately back to Ireland for burial in Bray County. In a poignant ceremony, the bracelet was ultimately returned by Esetlle Lefeuvre to a grand nephew of Josephine Heffernan. The documentary, recounting the 15-year search and its conclusion, recently aired on French TV. Watch a brief clip (in French). Nursing is, ultimately, a profession of caring about and caring for people. Marjorie DesRosier has made a career of doing just that. We are #1 public School of Nursing! Want Executive Dean Azita Emami to attend your event? Submit a request.